The Pike National Forest Map produced by the US Forest Servicecontains the most current information on roads, trails, recreationsites, travel restrictions and contact phone numbers for the Pike National Forest. Welcome to the Pike National Forest, named for the 14,110 foot Pikes Peak. 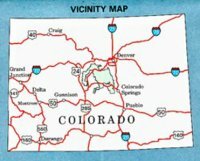 It is a busy urban national forest noted for the majority of fourteen thousand foot peaks in Colorado and stretching from Colorado’s Front Range to the wide-open grasslands of western Kansas. Over one million acres of landare yours to enjoy. Snowcapped mountains, wildflowers, golden aspen andalpine lakes, are all spectacular against the clear blue skies ofColorado. The map also contains Buffalo Peaks Wilderness, Lost Creek Wilderness and Mount Evans Wilderness.